At the United Nations, for example, she has fiercely defended Israel, presided over U.S. disengagement from several UN organizations, and occasionally embraced Trump’s swashbuckling style, once warning that the United States would be “taking names” of countries that criticized the Trump’s administration’s move of America’s Israel Embassy from Tel Aviv to Jerusalem. 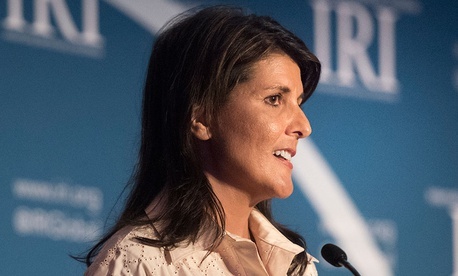 She was the first member of the Trump administration to make a detailed public case for why the U.S. should withdraw from the Iran nuclear deal. When Trump was bent on applying intense economic and military pressure to North Korea over its nuclear-weapons program, Haley shepherded the toughest sanctions ever against North Korea through the UN Security Council. She adroitly acted as a bridge between the United Nations and Trump World, finding ways for Trump to stay invested in the international body by working with the UN secretary-general on internal reforms while at the same time serving notice that Trump’s America would be conducting a fundamentally different form of foreign policy.